There can certainly be some frustrating eShop release gaps between Europe and North America, with the former coming off worse on most occasions. 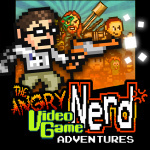 An example of this has been Angry Video Game Nerd Adventures, which came out in North America in Spring / Summer on Wii U and 3DS and has taken a little while to make the move to Europe. On a positive note the wait seems to be almost over, with the European eShop on both Wii U and 3DS listing the game for a 10th December release; these eShop dates are occasionally wrong, so treat this as a likely but not final date. We liked both versions when they came out in NA, though the visual style and neat 3D effect gave the 3DS iteration a narrow advantage in our opinion. With AVGN 2: ASSimilation in development and hopefully coming to Nintendo platforms, at least European gamers can catch up and see what the fuss is about while we all wait for more sequel news. Thanks to those that sent this in. I'd rather cuss word a cuss word's cuss word than play this cuss worded game any longer! Looking forward to trying this game, not sure what to think of it. If you want a laugh, try putting in the Konami Code on the title screen. About damn time, if true. Seriously, what takes NoE and indie developers so damn long... Do they have to look out for all of the swearing not managing to offend anyone in any of the countries? This would be awesome as a cross platform purchase option for Wii U and 3DS if they used the possibility. @RupeeClock I did not know about this. Thanks! I'd rather get Adventures of Pip over to Europe. Finally! Time to flip the cow-flop switch! I hope they discount it for being so late. Might give it a go if it's less than a tenner. Sweet, what a nice Xmas treat. While I can find it in the UK eShop, it's not listed in the german eShop. Hopefully, it'll change. If this doesn't include Australia like Binding of Isacc imma go cry in a corner. @EonCow Wait is Binding of Isaac not coming to Australia? NOOOOO! @DekersHekers Well it might but it came out in Europe on October 30th and we still haven't got it. @EonCow Lets just hope it doesn't get forgotten about, like Shantae 2. Still hoping the Director's Cut will come to Australia. Seriously, I'd gladly give up Bravely Default's month-long head start and get it a little later if we actually got all these games. I hope this does get an European release, it's been a while coming! This will be a nice play. Gives me hope for a 2d game i'm working on.